Volunteers are the lifeblood of the Bellin Run. Simply put, the event can’t go on without them! Each year, over 1,000 previous and new volunteers generously donate their time to make this wonderful community event happen. Their reward is nothing more than a free event T-shirt and the smiles on the faces of the participants that pass by. There are many volunteer job opportunities available. Volunteer registration for general volunteer positions:. Medical Volunteer registration will open in April. Please contact Roland Schmidt at Roland.Schmidt@bellin.org with questions. Each volunteer receives a special edition official Bellin Run volunteer T-shirt. 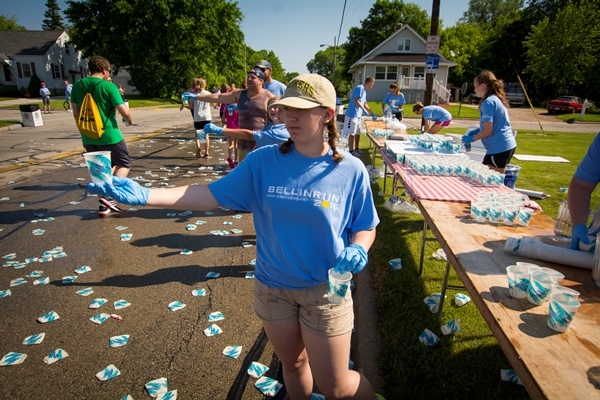 Let the Bellin Run help you fulfill those community-based volunteer service hours. There are loads of volunteer positions you can fill to earn those valuable service hours. Register to volunteer for the run and upon completion of your volunteer opportunity, send the appropriate paperwork to our volunteer coordinator. Selys Perry, volunteer coordinator, Bellin Run, P.O. Box 23400, Green Bay, WI 54305-3400. If you have any questions about volunteering for the Bellin Run, email them to selys.perry@bellin.org.